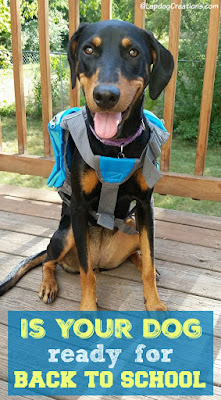 Lapdog Creations: Is Your Dog Ready for Back To School? Back to school time can be an adjustment for everyone in your family - including the furkids. Is your dog ready? We wanted to share some tips to help avoid boredom when the human kids return to school, as well as some for those of us who don't have tiny humans, but still want our dogs to be well-behaved during this time. If you have kids that have been home all summer or you're a teacher who's been off, your dog has probably enjoyed many fun-filled days of unrestricted playtime. But now that everyone is waking up early to catch the bus, she's left home alone and may be bored. 1. Get in a vigorous morning walk or play session. The more you tire your dog out, the more likely she'll be ready for a mid-morning nap. 2. If you drive your kids to school or walk them to the bus stop, take your pup along. Let them participate in the morning "send off" and know their humans are having fun. 3. Don't make a big deal about the kids' morning departure. Same goes for their return trip home. Keep it casual and make it a happy, routine part of the day. 4. Change your routine so that your dog gets his breakfast once the kids leave. It gives him something to look forward to after saying goodbye. 5. If back-to-school means your dog is now home alone for several hours, be sure to leave her with some interactive toys and treats. Stuff a Kong with peanut butter or hide treats in different spots around the house if your dog is not crated. 6. If you crate your dog, make it a fun, safe experience. Teach her that the crate is her safe place and it means good things. Make it comfortable, and be sure there's clean water and a few toys inside. Most of all, don't ever use her crate for punishment. I use the term "bedtime" to tell my dog to go in her crate and immediately follow with treats. 7. If your dog is home alone, leave the radio or television on for background noise. I've always done this for my dogs and I'd like to think they appreciate it. 8. If you're a little worried about whether your pup is having separation anxiety (perhaps the neighbors told you about his crying all day? ), get a 2-way security camera. There are some relatively cheap and easy to install ones on the market that not only allow you to peek in on your dog, but also allow you to talk to them if necessary. There are even some with treat dispensers attached that allow you to treat your dog while you're away! 9. If you are at home during the day, spend a little extra time focusing on your dog. Go for a walk or hike, or take a trip to the dog park. If you work from home and can't actually leave the house, get in a few 5 or 10 minute play-breaks throughout your day (they are good for your productivity too!). While we do not have any little humans in the Lapdog household, I hope these tips help those who do. I also wanted to share a few extras for our fellow furkid-only homes. 1. Don't allow your dog to bark at kids at the bus stop. This can be a difficult habit to break - I know from first hand experience. We are on a corner lot, which means there is a bus stop right next to us. Fortunately our house sets back off the road, but the dogs can still hear the kids. It's taken a lot of work over the years to get them to "ignore" this noise, but for the most part they'll bark to alert me and when I tell them to stop, they usually listen. Penny is my superstar here - the "leave it" command works wonders for so many things! 2. Teach your dog that big yellow buses and the loud sounds they make are good things - or at least, not scary things. Our dogs naturally try to protect us from anything they sense as danger. When they hear the bus, let them know it's no big deal. 3. Keep your dogs on leash. There should be no question about this during any time of the year, however we all have those neighbors, don't we? Bus stops can be noisy and kids may be joking around "screaming" or shrieking. Dogs cannot distinguish whether or not they're playing or in trouble, and an off-leash dog may run over to "help" these little humans. 4. If you happen to be out walking your dog during morning pick-up or afternoon drop-off times, be aware of kids. While some may be well educated on pet etiquette, most are not. Some may charge you and your dog demanding to pet it, others may act like fools and bark at it, and others may even try to be abusive (throwing rocks, or kicking as you walk by). Keep your dog calm and whenever possible, don't be afraid to educate. 5. If you have a reactive dog or one that simply doesn't like tiny humans, be aware of the bus schedules and simply avoid them as best a possible. We hope back-to-school time is a happy time for everyone! Disclosure: This post may contain affiliate links. If you click and make a purchase, I may receive a few pennies which help keep this blog running. Great suggestions, I'm loving tip #4 at the top, give your dog his breakfast after the kids leave so he has something to look forward to - brilliant! Penny looks super sweet & adorable with her little backpack! Penny looks so cute in her little backpack! Great tips, as always!! I especially love your advice on crates! I'm writing an in-depth article on you to properly introduce a crate to your dog! What marvellous tips to make your furry children feel so included in the coming and goings of busy family/school life. Not having children myself this situation never crossed my mind until I read this piece but is so important that the change in routine is highlighted so eloquently. Must re-fill Kongs. Must re-fill Kongs. I don't have kids being dropped off, but what a great idea. And feeding when the kids leave. I think about getting a video camera so I can keep an eye on my Golden and Dobie who have free reign of our yard during the day. I'm curious if they play, or just roam around smelling stuff or sleep all day. SO glad I don't have to worry about any of this!! But I wills hare with my friends who do! Back to school is SO hard for our pups. Thanks for the tips! Great suggestions. I never thought about working with dogs when school begins. We loved this post - it is so important to consider the 'whole' family when kids first go to school or return to school. Pets are emotional creatures and will most likely have a response. We like to create little 'celebrations' to welcome the children back home - mostly it's laying on the floor and allowing for cuddle time! This fall, for the first time, my dog went "back to school" with me as my Hearing Service Dog! Your tips are very appreciative. I need to get Marilyn out for active walks before school so that she isn't restless during my classes. I'm looking into getting a camera for Mr. N.
I don't have kids or dogs, but these are great back to school ideas... I like the one about breakfast after, most cats and dogs I know are food motivated. Really great tips! Ruby get stressed about change of any kind. Unfortunately, we both work outside the home and when my daughter is not at school she is at camp. Ruby and the cats are by themselves during the day all year round, but she still senses the smallest change in routine even if it's only that we are leaving 10 minutes earlier. Excellent suggestions. Kilo had a young boy in one of his 4 previous homes and still jumps up every day at 4pm (after-school) for a game of tug of chase etc. Luckily I can oblige most days and gets me up from my computer too. Thanks for the training tips! Love that your pup posed with the backpack, so cute! Those were great tips, our human kids were homeschooled so we had them around most of the time, but we sure did miss them once they grew up and got jobs and went off to college. These are great tips! I love that you shared ideas to not only make sure your dog is happy and not stressed about the change in routine, but also on how to have a well-behaved dog around kids, schools, and buses. These are great tips. I especially like the tips when bringing a dog to the bus stop. Penny sure does look ready for back to school. With homeschooling, the dogs just have to get used to more time in the school room again. These are excellent tips for the pups. You don't normally consider what the pets have to go through during this transition! 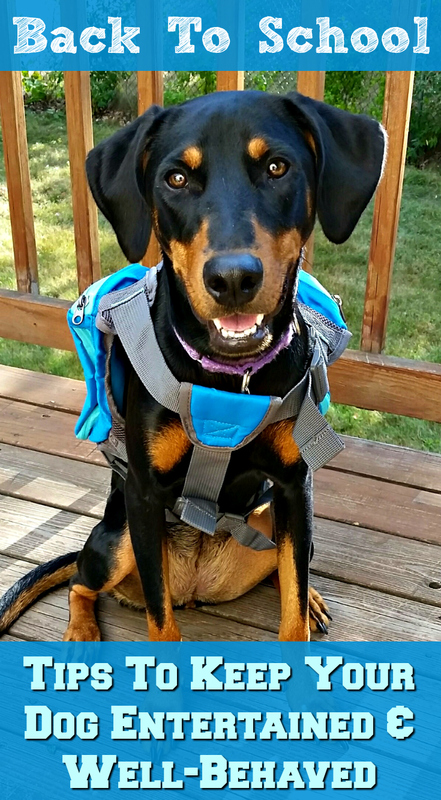 These are great tips, love this post about back to school for the pups! The dogs need to be ready too, such an adorable post! I hadn't thought about how the sudden changes would affect your dog. These are really good strategies! One of the things i enjoy about working from home is that nothing changes for our dog. It is a parents job to educate their children on how to handle encounters with pets that aren't their own. These are all great tips. We did a few of these when my kids were still of school age. Our dog was super protective of the kids and I made sure she was kept on a short leash whenever we go out to the bus stop to walk the kids home. All good tips! It can be stressful for pets to when suddenly the whole house is empty!